As a Development professional, with 14 years of experience Pranav has worked on Social Research, Disaster Risk Reduction, Child Rights, Livelihoods and Skill Development themes and also got opportunities to lead Change Management, Leadership Intervention in Organisation (Arbinger), and managed large scale Programs and Partnerships. He was also given the responsibility to provide leadership support during Leadership transition in the Foundation. Pranav joined Dr. Reddy’s Foundation in 2008 and currently leads Foundations’ flagship skilling program as Director Operations. In the 2017 Annual Status of Education Report (ASER) – the largest citizen-led survey in India and the only annual source of information on children’s learning outcomes – it concluded that unless young adults are equipped with the knowledge, skills, and opportunities to support themselves, their families, and their communities, India’s much awaited ‘demographic dividend’ will not materialize. Not only are learning outcomes below average in schools, but the report also shows that the youth today do not find today’s skilling programs attractive. Despite the availability of easy funding/CSR supported programs, most youth are still facing career mobility challenges, emphasising the fact that only 2-3% of the national population is skilled, compared to our Korea (96%), Japan (80%), Germany (75%), UK (68%) and China (40%) counterparts; This is not the best utilization of the nation’s limited resources. This chart reflects how India is moving quickly to become a middle-income nation. 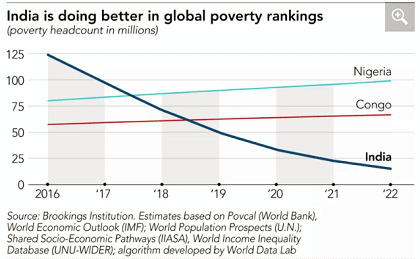 New data from the World Bank also shows the number of Indians living in poverty falling rapidly — from 125 million in 2016 to around 75 million today, to 20 million in 2022. This data thus becomes important to understand how it will impact the aspirations of youth. INR 5000-6000 jobs or entrepreneurial activities are no longer attractive to them despite their lack of quality skillsets to move to the middle income group. Only quality education and future ready quality skilling will help them to take this journey. Industry-aligned core employability skills are domain agnostic and meet the job requirements of multiple sectors. These skills include different levels of written and communicative English skills, computer operations (including typing) aptitude, work readiness and interview skills. Our market research found that majority of the entry level careers expect a certain degree of core employability skills. Therefore, GROW emphasises core employability skills training so that students have more career options to choose from, whilst meeting employers’ needs. Our new IT platform is the backbone of our program implementation and maps the entire life cycle of youth. Its most unique feature is the analytics-driven matchmaking engine that helps to place youth into relevant career tracks based on their aspirations and competencies. Despite a well-validated theory of change, successful placements depend on a complex set of social factors. 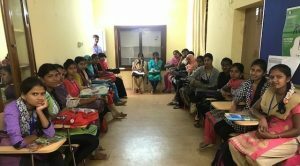 By measuring the skill shift through pre and post assessments, investing in trainers’ capacity, and registering quality employers on the GROW platform, GROW has been successful in attaining an INR10,000 salary benchmark for students, which is an average of tier 1, 2, 3 cities’ salaries. However, we have also been seeing students deferring their placements after completing training. The top 2 reasons are – higher studies for male aspirants; and parents not allowing female candidates to find career placements due to marriage obligations/cultural issues. To address this issue, we have been finding best approaches to counsel parents during the admission process, by inviting working alumni to share their journey and orient parents on how they can support their wards in joining and continuing the jobs. In 2 years, we realised that we have under-anticipated the duration of GROW’s incubation period, especially in establishing trust and credibility within the community. Nonetheless, the program has made rapid progress in its second year, with an increase in the total number of youth skilled per centre. In fact, the program is 100% stabilised on enrolments from Feb 2018 onwards. We credit our success to our extensive marketing initiatives and well-researched counselling, training and placements processes. We also have differential fee system, based on the paying capacity of the aspirants. This ensures that it is affordable across all economic sections and helps in effective resource utilization of donors. At present, GROW is operational in 57 centres and spread across 18 States with the support of our long term partners (MSDF, Accenture, JP Morgan, AMM Foundation). Not only are we planning to further scale GROW within other communities, but we are also scaling certain components of GROW (such as the English curriculum). In the next 2 months, we will be also conducting first 3rd party impact evaluation to benchmark the GROW program and will be sharing the further learnings with the eco-system.